The menu on the left provides an additional 10 video tutorials that take your skill to a higher level than the series of 15 free video tutorials for Excel provided on this site. The total duration of the videos is approximately 63 minutes and covers many of the skills you will need to create and present your work in a more professional setting. by purchasing the resource "Creating a Financial Model" exclusive to this site. 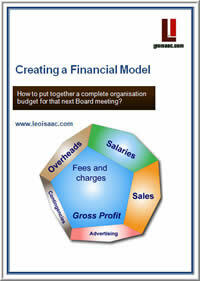 Purchasers of the "Creating a Financial Model" learning resource obtain the access code free. Follow the link above to learn more about the resource which is currently priced at AU $14 (Australian Dollars). by purchasing the password separately for AU $5, see buttons below. The password is delivered in a PDF document.